Welcome to NSGEU’s Bully-Free Workplaces Program. 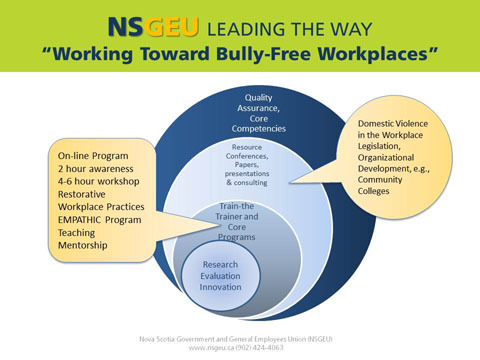 NSGEU’s Bully-Free Workplace Program was launched on Sept 8, 2010 and has been delivered to our members and employers throughout Nova Scotia ever since. At the core of our approach is the understanding that peer-to-peer facilitation is an effective method to begin discussions about workplace bullying and to facilitate solutions. We have trained NSGEU members as facilitators who are available to go into workplaces across the province to deliver our landmark program. Bullying is a form of violence in the workplace; it is not part of the job. We all have a responsibility to stop it, and to create workplaces free from bullying. We look forward to working together with our members and employers to address Bullying in the Workplace. January 16, 2013 – The Mental Health Commission of Canada (MHCC), the Bureau de normalisation du Québec (BNQ), and CSA Group released Canada’s first national standard designed to help organizations and their employees improve workplace psychological health and safety. The National Standard of Canada titled Psychological Health and Safety in the Workplace is focused on promoting employees’ psychological health and preventing psychological harm due to workplace factors. A clear business case supports the need for continual improvement of psychological health and safety. Workplace bullying affects organizations through reduced productivity, increased staff turnover, and legal costs. Workplaces with a positive approach to psychological health and safety have improved employee engagement, enhanced productivity, and a better financial outlook. A healthy workplace is characterized by lower absenteeism, increased productivity, reduced staff turnover, improved morale, increased work quality, and improved physical and emotional health of employees. The Standard has been approved by the Standards Council of Canada as a National Standard of Canada. For more information go to http://www.csa.ca/cm/ca/en/news/article/national-standard-of-canada-psychological-health-and-safety-in-the-workplace. Evaluation – An important component of the program is that the program meets the goals of the Project Charter, the needs of NSGEU members and others. Evaluation and employer feedback directs to what future strategies and interventions may be required. Mission: To be a leader in advancing the right to dignity on the job through delivery of programs to promote Bully-Free Workplaces and Restorative Workplace Practices. Peer-to-peer facilitation is an excellent starting point in discussions about workplace bullying. Our trained facilitators, who are NSGEU members, are available to deliver the NSGEU Working Toward Bully-Free Workplaces program across the region. This program also supports facilitators who are outside of the NSGEU as well as those offering our program in other provinces. Bullying is a form of violence in the workplace and we all have a responsibility to stop it and work toward Bully-Free Workplaces. Workplace bullying is unwanted and unreasonable behavior directed toward an individual or a group of workers that creates a risk to health and safety. Workplace bullying can also affect an organization through reduced productivity, increased staff turnover, and legal costs. Benefits to the Employee: Our program will help identify whether or not you are being bullied. Not all conflict situations in the workplace constitute bullying or harassment. It is important to recognize the difference. Some of the topics we address: Defining and identifying bullying behaviors, effects on employees and workplaces, personal and formal remedies. Identifying the Risks: Workplace bullying can be subtle and hidden or obvious. Obvious signs of workplace bullying may not be evident; however, it does not mean that such behavior or conduct does not exist. Our program helps to identify environmental factors that increase the potential for workplace bullying. Benefits to the Employer: A physically and psychologically healthy workplace is a productive workplace. A healthy workplace is characterized by lower absenteeism, increased productivity, reduced staff turnover, improved morale, increased work quality, and improved physical and emotional health of employees. Management Strategies: A multi-level strategy involving workers and their representatives is the most effective way to deal with bullying in the workplace. This includes developing specific strategies against psychological harassment and bullying and making improvements in the psychosocial work environment.